I considered lots of different house plan ideas. I suppose it’s only natural given the fact that I really enjoy home design. On this page I reveal all the home design ideas that were considered during our design journey. Some ideas are mine. Some are from friends and family others came from our architects. Because they're only ideas, the sketches on this page are rough and ready, doodles really. I just want to pause to introduce a word that architects use. That word is parti. It comes from the French word for ‘treatment’ so I suppose it refers to how to treat a design problem. It’s really just a posh name for an idea or high level design scheme. So now you know! The vast majority of these house plan ideas didn’t end up in the final design. My hope is that some of the ideas here that I didn’t use will give you some inspiration for your home design. 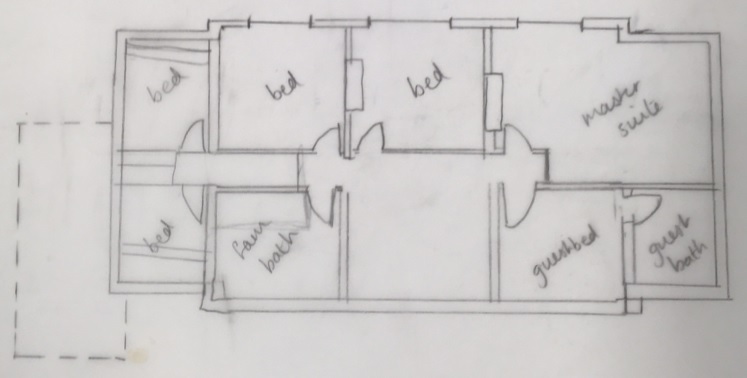 One of the main drivers of the design brief is to include more bedrooms. I think upstairs is probably the best place for the new bedrooms. Looking at the downstairs floor plan, one of the most obvious things to do at first glance is to build on top of the garages. Well what I mean by that is the two original garages immediately either side of the main 3 bay design of the house. We decide to engage a structural engineer to come and take a look at the foundations and it’s good news. They’re deep and strong enough to take a second level. Here's a house plan idea that use the building above the garage concept. Let’s have a look at this parti from an efficiency point of view. The roofs will be capped whether or not we build a second level on the garages because I’m not a fan of flat roofs. We’re looking at about 9m length of wall to be built for each garage which would give us about 9sqm of space which isn’t terribly efficient. It’s a lot of wall compared to the space created. The other thing to consider is the quality of the space. 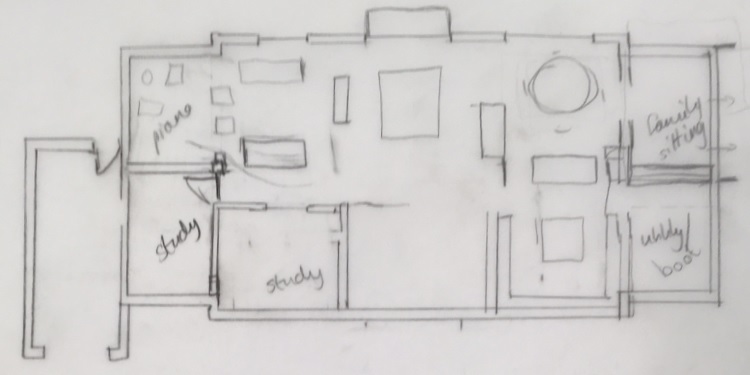 The rooms created would be just under 3m x 3m (approx 9ft x 9ft) which would be very tight for a double bedroom. 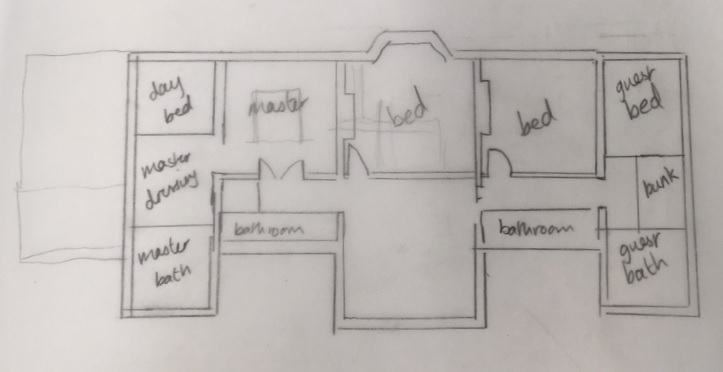 So this means this space could be used for a small bedroom or perhaps bathroom or dressing room depending on how the internal layout turns out. If we take a look at the elevation it looks quite nice in 2D but I’m concerned about the hollows that the double storey bump outs create at the front of the house. I think it might be a bit dark and feel unwelcoming. This idea was put forward by our first architect for consideration. 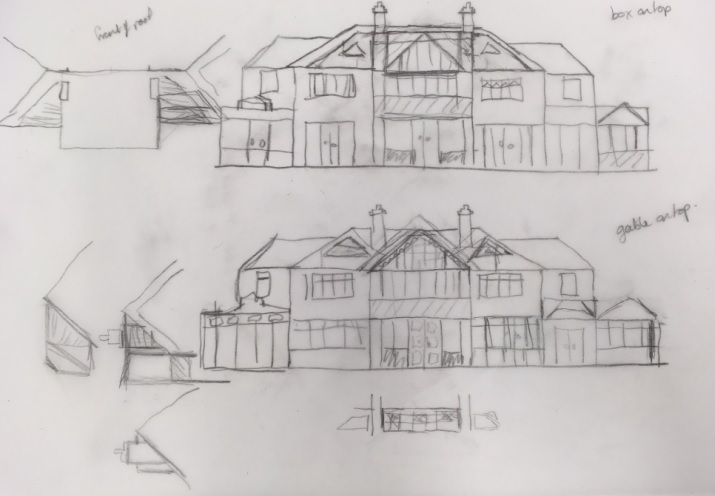 The idea is to take the outline of the garage (original and new) on the east side and use this as a footprint to construct two new ‘houses’ to either side of the current house. Here’s a drawing of how that might look. There are a few things I don’t like about this idea. I don’t like the roofline. It’s possible to build the roofline across to join but that would be a lot of extra roof to build purely for aesthetics. I feel it’s important for the new rooms to be at a comparable plane with the south façade of the existing house. I think the views from the south facing windows in the new blocks are compromised by the mass of the current house. The placement of the new blocks also means that any ‘bump out’ into the garden will need to be built on the back of the current house which will put the area to the east of it into shade. It’s not a terribly efficient design. There’s lots of wall to build to get the space. This design, while it doesn’t come forward of the current building line is definitely provoking the building line concept because the mass and height of building right up along the current building line is so much more. This concept was also suggested by our first architect. And it’s the house plan idea that we develop into a more developed design. The span of the wings on either side is taken from the extent of the original garage and new garage on the east side of the house. I like this concept. The symmetry appeals to me. Downstairs, the new spaces are enough in line with the rest of the house. There’s no bump out into the garden but that can be added. It’s an efficient way of gaining space. 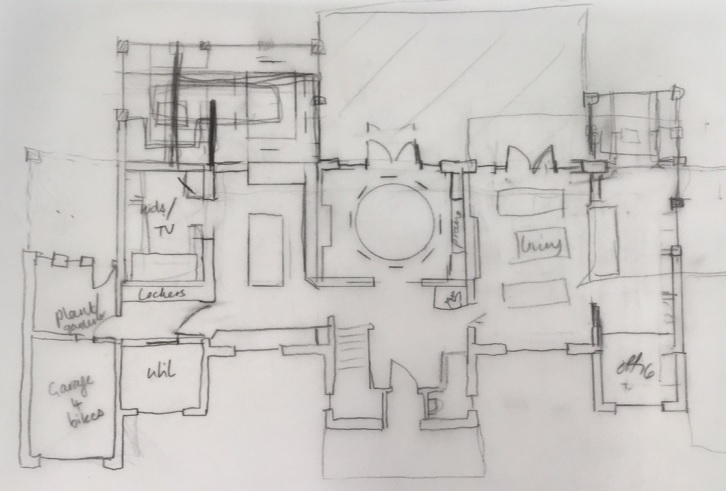 Going over all these design ideas reminds me how attached to symmetry I am when it comes to floor plans. I managed to overcome it in the end because the final design isn’t symmetrical. 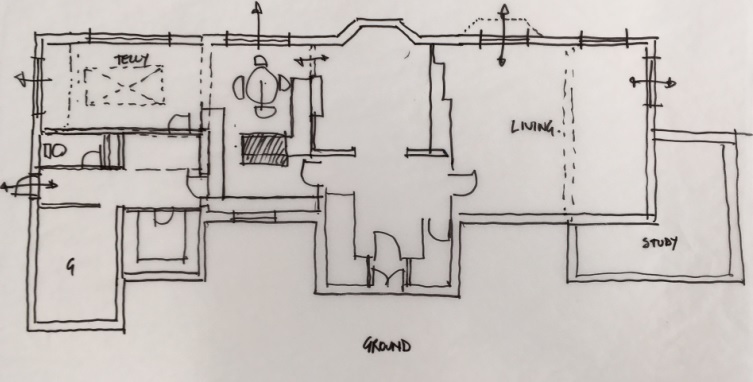 It’s important to remember that your home won’t be experienced as a set of plans with a floor plan and an elevation but as a series of spaces. Another way to add depth to the spaces at the front of the house would be to widen the house. The back of the house could be extended all the way along. This would mean that the corridors would need to move as well. It makes better sense to move the front walls either side of the central bay forward. The issue then is what to do about the roof line. The extended sections could be left flat, capped with some sort of dormer. Or the roof could be raised and replaced. I’m not sure if we’ll get permission to raise the roofline. Altering the walls at the front would mean that the ivy, a major feature of the look and feel of the exterior of the house would have to be removed. The thing about both these ideas is that they don’t actually get much extra space, they just make existing space a slightly better shape. It would be a shame to have bedrooms to the north when there’s all that potential to the south. I am a fan of attics having had an attic bedroom growing up. The shallow pitch of the roof means that it’s unlikely that converting the attic space will yield two ‘habitable’ bedrooms. But the possibility is worth examining anyway because there’s potential to create a useful space even if the ceiling is on the low side. Creating a large central dormer. Flattening the central bay and creating two dormers. I drew up one flight of fantasy design where the current house is sort of swallowed up by a bigger house behind. Where will the attic stairs go? Given the shape of the roof the stairs would need to arrive fairly centrally in the attic. I wondered about putting the stairs to the side or in front of the central bedroom. Another possibility is making use of the spaces at the front of the house. If you find yourself sketching out ideas on your own I highly recommend doing this. You’re doing the right thing. It gives you a chance to develop a real sense of what you want and your priorities. And there’s no better way of generating house plan ideas than trying out lots of different design scenarios.